At P&R Alarms Ltd we pride ourselves on our commitment to new technological innovations in the field of Access Control Systems. 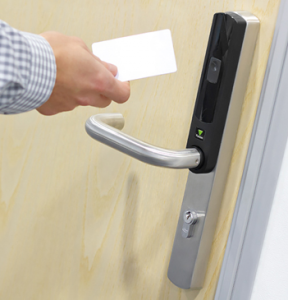 Access control is a security system which enables you to control and monitor who accesses your premises. It can also be used to control who accesses certain parts of your premises. Choosing an access control system is an important financial decision for any company balancing value with security. It gives the benefit of additional security without requiring time-consuming administration – providing you with the support and security you deserve. We can design systems to suit your needs; anything from a standalone system through to a PC based system called Net2. We use Paxton Access Systems, which are intuitive and straightforward and the increased security is a benefit to everyone. You can nominate people to have permission to unset and set the intruder alarm. When they present their token to the door, if the alarm is set, only those nominated people will be able to access the building. This easy-to-use feature helps prevent false alarms, by stopping any member of staff from entering the building until the system is off. The PC based system Net2 can send SMS or emails through its Triggers and Actions functionality when a specified trigger event occurs. Receive a SMS message if a door is forced or have an email sent to you when staff arrive, ideal for remote premises with lone workers. See who is at the door before you let them in and view what is happening throughout your building. Turn lights on when you arrive in the morning. Turn them off when the alarm is set at night – easy with Triggers and Actions.